"...The loneliness and alienation sometimes feel a tad generic because of the way the play is written. Conceived by PJ Paparelli , who wrote the script with Stephen Karam (the authorship is officially credited to the United States Theatre Project), “Columbinus” draws on documentary evidence, as well as interviews with survivors and others affected by Columbine and comparable events. In scenes set in a fictional high school, the play’s first half often paints a broad picture of insecure teenagers coping with everyday humiliations such as bullying in a locker room. This is familiar territory, from pop culture and, for many, real life." "...IT’S BEEN 20 YEARS since Eric Harris and Dylan Kleibold committed the national tragedy we now call Columbine. The high school shooters, who killed twelve of their fellow students, and one teacher, have since been followed by a scarily long list of disaffected young, male mass killers, a phenomenon that columbinus expressly attempts to put into perspective." "...The play is a true ensemble piece and co-directors Alex Levy and Juan Francisco Villa have assembled a strong and compelling cast: Jennie Bissell, Brett Cassidy, Patrick Joy, Thais Menendez, Joe Mucciolo, Rocky Nunzio, Jonathan Palmer, and Alex Reeves. The eight actors play teachers, parents, employers, counselors, community members, and, at the very crux of columbinus, they play high school students with all their flaws, vulnerabilities, confusion, and fury." "...Co-directors Levy and Juan Francisco Villa have deliberately set this production in a very, very dark place. It's a fictional high school that could be anywhere because the potential for a school shooting could be anywhere. But at 1st Stage the turbulent world of adolescence that columbinus immerses us in has been conceived by Set Designer Kathryn Kawecki as a black cage-like hellhole, with funhouse mirrors reflecting back every teen's anxiety about fitting in. Lighting Designer Conor Mulligan splits the darkness with light so stark it eviscerates privacy. Sound Designer Kenny Neal plays angsty emo rock and tracks of strange distortion. And this unsettling setting becomes more and more relevant as we witness the ensemble of eight students enact all the everyday dynamics of dominance and disparagement that leave no one with a worthy sense of self and that drive some to retaliatory rage." 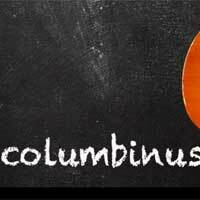 "...columbinus does succeed in capturing the mood of high school circa 1999 (I should know; that’s my era), from the attitudes prevalent at the time to the moody music of Tori Amos and Nirvana, and everything in between. But, as impactful as Act II is—using the words of the real players, including the 911 call made by teacher Pattie Nielson from the library where the majority of deaths occurred—as a docudrama, it is little more than a reliving of the moment, ending with snippets from parents in more recent years that confirm we’ve merely dropped our heads in unison. There is little by way of thoughtful commentary on the why of it all, which the play acknowledges. In 2003, what was there to say? columbinus is a full 15+ years old, and I can’t help but wonder what the playwrights imagined at its writing—surely, not that in 2019 we’d be still languishing in the doldrums, and believing that a retelling of April 20th, 1999 would be lesson enough to avoid its repeating."